This is an authentic report from an Aleppo resident whose identity is protected for their own security. 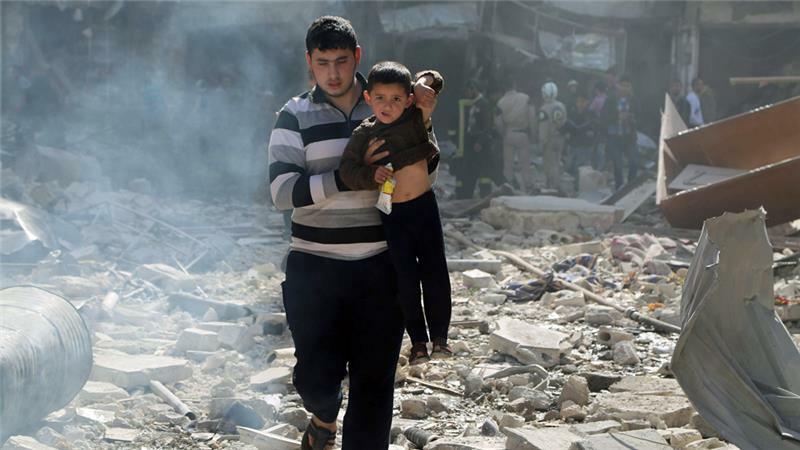 They are living through the daily hardships of life in an externally created war zone. Water and electricity shortages, NATO & US backed terrorists embedded in multiple areas of the city creating random buffer zones where the risk of being sniped or shelled is a daily occurrence. Many good people are still going from one part of the city to the other. Many people didn’t deserve to be kicked out from their homes, and it wasn’t their choice to stay in one place or became refugees in another place. Visiting each side is still possible for people, but it’s dangerous and not a risk I would want to take. My understanding is that on the 13th/14th of July, the Syrian army – who are occupying the very strategic acropolis hill of the ancient citadel of Aleppo, in the middle of the ancient walled city, which is under the terrorists’ control – knew about a new tunnel that the terrorists were digging and filling up with explosives, very close to the citadel’s borders. The Army made a counter attack and forced the terrorists out of the tunnel in a hurry. Unfortunately the terrorists detonated these explosives before they left, and that explosion was enough to destroy part of the ramparts of the citadel. I cant help thinking if the Army hadn’t discovered this tunnel and if terrorists had drilled a longer and deeper tunnel, and armed it with 10 times more explosives, maybe the whole citadel would have collapsed. 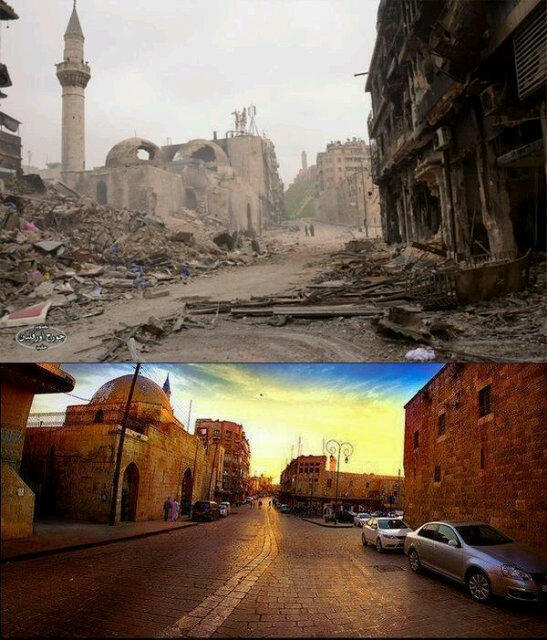 Khosrawiyya/Chusruviyya mosque, the first and oldest Ottoman mosque in Aleppo (built in 1544) has been demolished. Same for Carlton Hotel which occupied a century old building as a multi million investment. The Mayor’s town hall, 12 stories high, has been 80% destroyed. A Memluk or Ayyoubid period small mosque and religious school [700-1000 years old] has disappeared apart from its gate and the little minaret above the gate. The Traditional/Turkish Bath of Yalbogha al-Nasseri [700-800 years old] is still there, but some of its big domes have collapsed. Another century-old building – that I remember sitting in for 3-4 hours 15 years ago, manually copying some information to use in my graduation project – has been damaged so badly, especially its beautiful double mirrored spiral staircase at the entrance, that has disappeared without a trace. Those buildings have all been destroyed by the same terrorist techniques, within the last 4 years of war in the city: digging tunnels, or using ancient existing networks of tunnels under the whole old city of Aleppo. Filling them up with explosives, to bomb everything above them. While these explosions serve as a distraction, terrorist troops will attack another goal, mostly the citadel where the Syrian army is encamped. They failed so far take control of the SAA stronghold, but damage to the citadel is extensive. Although what I mentioned above is horrible, and I know about other famous areas (markets, bazaars, mosques and churches) that have been sabotaged or destroyed; I was pleased that way more areas and buildings of the old city are still there, as I know them. Maybe they are not that famous or masterpieces, but they are still there untouched and intact. The Great / Umayyad Mosque is a symbol, it’s almost 1000-year-old minaret has been destroyed by dynamite. The preaching stage has been dismantled (most of it taken to Turkey), several walls and sides walls have been completely destroyed. They turned the mosque into its original and oldest land use: an Agora (Plaza) in the Hellenistic era. A similar fate for all the other lost places and monuments. 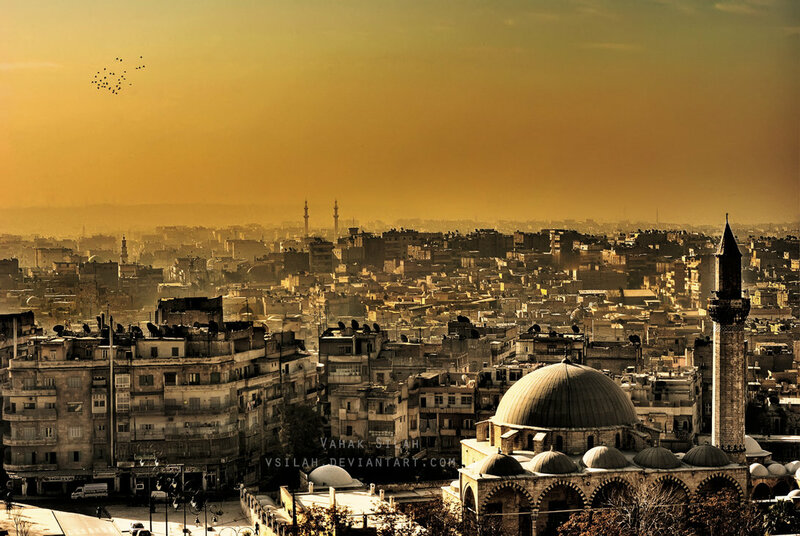 The last symbol left of Aleppo, is the most famous one: the Citadel. I can see part of it from our balcony, but I can see it more clearly from the roof of the building. It’s still there, resisting the terrorists and their funding states. It has been badly injured, but it’s still there, dominating the city skyline. It’s where they found the Storm God’s Temple [2nd millennium BC] a few years ago. It has withstood many invaders, including the Mongols and Crusaders. It has been damaged severely several times through history, but it has been rebuilt over and over again, as an immortal symbol to the inhabitants, of one of the oldest living cities in history. I just pray I dont live to witness its total destruction as I have seen happen to many of the surrounding buildings. At night during Ramadan, some areas were still playing live music while audiences smoke their sheesha and enjoying a cold drink. One cant help but admire the spirit of these musicians, resisting all the harsh situation of the crisis. My brother saw his once rich and wealthy friend selling small items (plastics, gums, ..etc) on the street in front of a mosque, and he didn’t believe it. He told him that he lost everything, and he has a family to feed and needs to put food on the table. Turkey dismantled and stole his factory. His land has been burned, his properties have been either damaged or stolen, and he was bankrupt in no time at all.